COLUMBUS, Ohio — At the west end of The Ohio State University’s Columbus campus, within eyeshot of Ohio Stadium and the Columbus city skyline, passed by thousands of commuters daily, lies a soil study site about the size of a basketball court that could help change the planet, or at least about 4 billion acres of it. 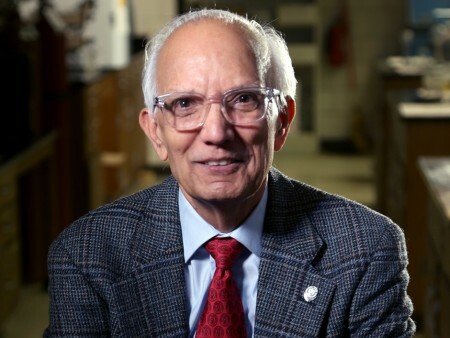 In a recent study done at the site, a team led by Ohio State soil scientist Rattan Lal found that topsoil erosion, in addition to reducing crop productivity, causes the release of greenhouse gases. However, the study also suggests that topsoil can be rebuilt, and the harmful effects of its loss reversed, faster than had been previously thought. “The general statement is that forming 1 inch of topsoil may take thousands of years,” said Lal, who is Distinguished University Professor of Soil Science in the College of Food, Agricultural, and Environmental Sciences (CFAES). But adding organic matter such as compost to eroded land could shorten that time significantly, he said. Lal also is director of the Carbon Management and Sequestration Center in CFAES’s School of Environment and Natural Resources. The study appeared recently in Scientific Reports, which is published by Nature. Lower crop productivity affects farmers’ profitability, and in developing nations, can lead to food insecurity and hunger. Rising greenhouse gas levels, meanwhile, are causing climate change, and with it, problems such as weather extremes. In all, topsoil erosion affects slightly more than 4 billion acres of land around the world, Lal said, an area about twice the size of the continental United States. Water causes about two-thirds of that erosion, wind the other third. The harmful effects include lower crop yields and higher production costs for farmers because topsoil is the richest soil layer. Topsoil erosion also can carry sediments, pesticides, and nutrients from fertilizer and manure into lakes and streams. Phosphorus, a cause of the harmful algal blooms plaguing Lake Erie and other water bodies, can be one of those nutrients. But erosion’s impacts usually appear slowly. Erosion-caused yield losses, for example, “may not be recognized until crop production is no longer economically viable,” the authors wrote in the study. It’s also for that reason the study was done: to try to measure those “quiet” impacts. It took place at a long-term experimental site at CFAES’s Waterman Agricultural and Natural Resources Laboratory, a 261-acre facility at the corner of Columbus’s West Lane Avenue and Kenny Road. The experimental site, which Lal started in 1997 and continues to use today, has three main plots. Each plot covers about 190 square yards. The three plots combined would span the basketball court in Ohio State’s nearby Value City Arena with a bit left to spare. One plot had about 8 inches of topsoil spread on it to simulate long-term deposition, as when a river tops its banks and drops sediment in its floodplain, or when a river dumps sediment in its delta. Much of that sediment is eroded topsoil. The third plot was kept as an undisturbed control. Fifteen years later, during the 2012 growing season, Lal and his colleagues grew corn on the plots, regularly collected three greenhouse gases emitted from the soil — carbon dioxide, nitrous oxide and methane — and, on subplots within the main plots, evaluated the effects of two soil amendments: synthetic fertilizer and composted manure. They later analyzed the results. Corn yield on the eroded-topsoil plot fell by about half, 51 percent, compared to the control plot. Corn yield on the added-topsoil plot rose by almost half, 47 percent, compared to the control plot. Global warming potential, a measure of the ability of gases to trap heat, was about the same between the eroded-topsoil plot and the control plot but was about 40 percent lower on the added-topsoil plot. Composted manure increased corn yield by 18 percent, increased global warming potential by 15 percent, but reduced greenhouse gas intensity, a ratio of emissions per unit of product — in this case, corn — by 3 percent, all as compared to synthetic fertilizer. He noted that methane and nitrous oxide are much more powerful greenhouse gases than carbon dioxide, which means, ideally, “we should try to conserve soil and not let excessive erosion happen” in the first place. He said his next steps are to continue evaluating the plots’ greenhouse gas emissions, to continue looking at ways to mitigate those emissions, and to get further answers on how quickly topsoil can be restored, a topic called rate of new soil formation. Lal’s co-authors on the study were Ruiqiang Liu, who was a postdoctoral researcher with the carbon management center; and Shengli Guo, Yanru Liang and Yaxian Hu, all of China’s Northwest A&F University, who were visiting scientists with the center. Lal said getting published in Nature isn’t easy. He said he’s proud of the team’s achievement.